Today’s Flash Back Friday takes us to Episode 59, from July 27, 2012. Would you be ready if there was a major attack on a US city tomorrow? What would you do? Where would you go? How will you know that what you’re doing is going to actually keep you and your loved ones safe? Today’s world is a complex, and frightening, world. Jason Hartman talks with political scientist Joel Skousen, about how to properly prepare yourself for the uncertain times that we live in. 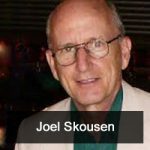 Joel Skousen specializes in the philosophy of law and Constitutional theory. He is also a designer of high security homes and retreats. He’s done projects for people and organizations all across North America, and aided with locations in Central America. Joel’s book Strategic Relocation: North American Guide to Safe Places, aims to help people figure out what their plan is if disaster strikes. Joel is also a former Marine Corps fighter pilot, and served as Chairman of the Conservative National Committee in the 1980s.